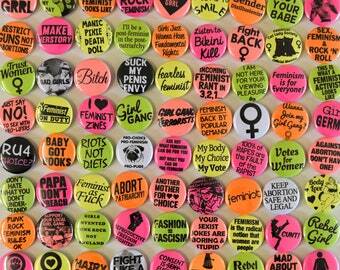 Candy Punk, a feminist fun shop. When Candy Punk was originally conceived I imagined something completely different to what it would ultimately become. Initially it was going to be a candy store. Yep! Full of yummy treats in distinctive handcrafted packaging with an alternative bent. But there was one (among many) problems with this half-baked idea - Australia's hellish heat! In the non-airconditioned flat I was renting at the time, this simply was not a practical venture! With that idea in the can I decided to completely change tact. 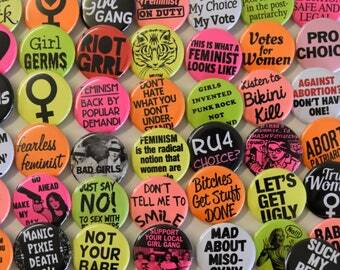 Excited by the renewed interest in feminism and riot grrl, which I had grown up with in the 1990s, I drew on my background in graphic design and button making to create a new line of feminist themed buttons. Wanting to create a big and bold button range with a sense of fun, I chose to work almost completely in bright fluro colours. To me, 'candy' is like another word for 'colour', so the teaming of feminist slogans with bright neon colours seemed to be an obvious fit with the Candy Punk name. A year on since the relaunch I have been surprised and delighted by the support my little store continues to attract. Feminism is still a much needed force in our world. 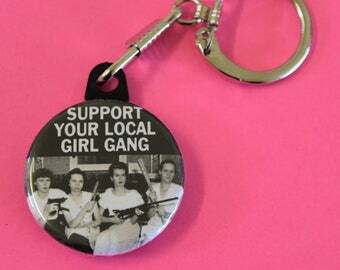 The enthusiasm of my fantastic customers renews my motivation and hope for equality every day.